The love of untouched beaches is hard to describe and Cape Leveque offers just that and more! The cape is the northernmost tip of the Dampier peninsula, 240 kilometres north of Broome- adorned by white sand beach resting in front of a reddish terrain. A soulful walk by the beach or a relaxing picnic with family and friends, the Cape Leveque is a must when you visit. Since the cape is a long distance from Broome, do try to spend a day or two at Kooljaman Camp located at the cape. Call up Koojaman Camp for accommodation prices and bookings or visit their official website. Rent a Car to reach the place. How popular is Cape Leveque? People normally also visit Broome Bird Observatory while planning their trip to Cape Leveque. 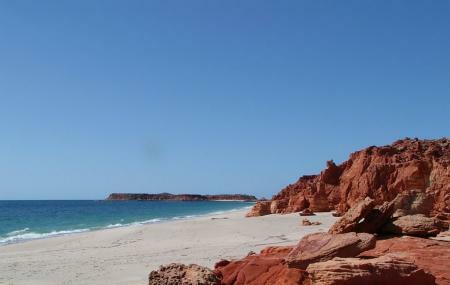 People also prefer to start their day with Cape Leveque. Amazing part of the country, well worth a visit. We had some issues extending our stay, management couldn’t “manage” the situation. Luckily travellers have good people skills and we did their job for them and everyone ended up happy. Still a bit to learn in the customer service department but it may come with time. Worth the trip up the dirt road, the scenery here is unlike anywhere else. From the pindan cliffs of west beach to the white limestone cliffs of east beach, the white sand and the crystal clear water, to the breathtaking sunsets over the Indian Ocean. Drive or fly, make sure this is on your Kimberley bucket list.